The second strongest earthquake ever recorded occurred at 5.36 pm AST (3.46 am 28/03 UTC) on Good Friday in Prince William Sound, Alaska. Registering a massive 9.2 on the moment magnitude scale, it shook the region for 4 and a half minutes and generating a tsunami which propagated through out the Pacific Ocean. At the time of the earthquake Alfred Wegener’s theory of plate tectonics was only just being proven by surveys of the worlds oceans. 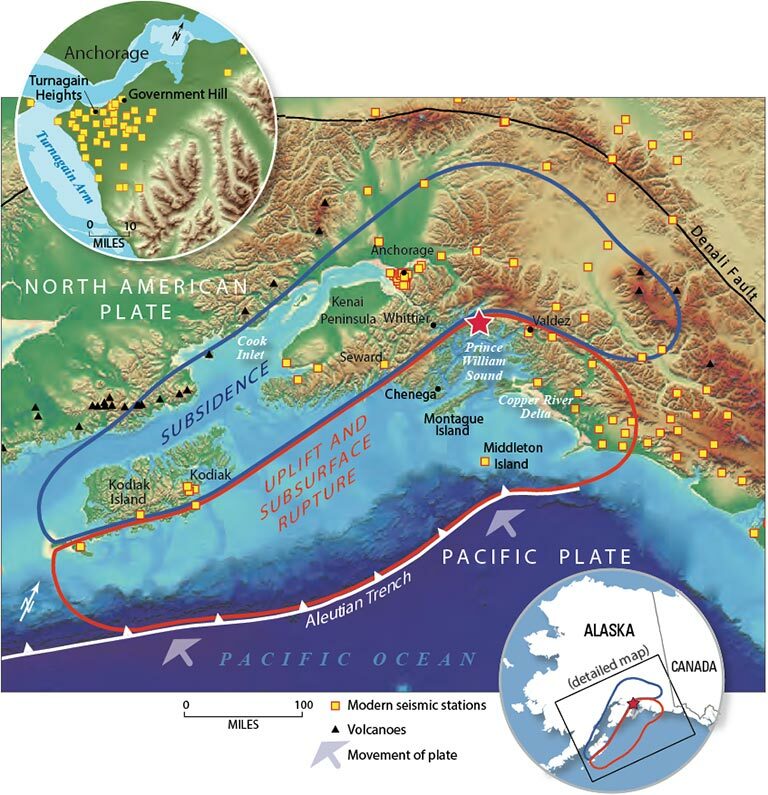 Although the study of seismology and the several large subduction earthquakes which happened in this era helped prove the theory it meant little was understood about the mechanics of megathrust earthquakes (a termed created in the wake of the Great Alaskan Quake). Earthquake resilient building standards where at the time and all where unprepared for the events of the Easter weekend. At a depth of just 23 km the focus was just 125 km northwest of the states capital Anchorage which took most of the damage.It hit a high of XI on the Mercalli Intensity scale, the second highest mark, indicating the intensity of the shaking experienced in the area. The shaking tore apart buildings and subsidence ripped apart roads. Anchorage was built on sandy bluffs and clay, the earthquake caused a landslide which buried 75 homes. The control tower at Anchorage International airport was reduced to rubble. 139 people lost there lives, mainly due to the tsunami which badly hit much of the Alaskan coastline but also claimed lives as far away as Crescent City, California where 12 were killed. At its maximum the tsunami reached as high as 220 ft in Shoup Bay, but most were much smaller. 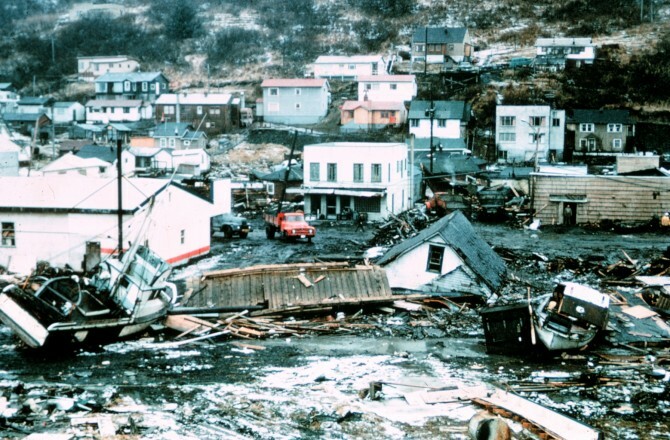 Alaska was actually hit by multiple tsunami, one caused by the earthquake itself and then several local smaller waves up to hours later prolonging the suffering and hampering rescue operations. The Great Alaskan Earthquake changed much of our understanding of the sheer power of our planet, which rang like a bell with vibrations for days after. Waterways as far south as Texas sloshed from side to side as the seismic waves where felt throughout the continent. USGS worked quickly to collect data, recording the subsidence and uplift in the region. They began to see how secondary faults accommodated the erratic displacement. They also began to form a much clearer picture of the Aleutian Trench where the Pacific Plate subducts cementing the idea of plate tectonics. It also shone light on the major part soil liquefaction had in the destruction of the area. Core samples taken along the Copper River indicated that the Good Friday was not the first megathrust event in the area. Analyzing just 50 ft cores scientists revealed evidence of 9 megathrust earthquakes in the past 5,500 years. The events of March 27th lead to the USGS beginning installation of an extensive earthquake-monitoring network across Alaska as part of the Advanced National Seismic System. In 1966 the National Earthquake Information Center was established as apart of the US Coast and Geodetic Survey and was transferred to USGS control in 1973. By 1977 Congress passed the Earthquake Hazards Reduction Act, the world was beginning to take the threat seriously. I am pretty sure I have covered this event before but seeing as today marks the 5 year anniversary of one of the worst natural disasters in the past decade I thought it deserves a much more in depth look. The events of March 11th destroyed the lives of hundreds of thousands of people and claimed the lives of nearly 20,000. For me, it opened my eyes to a world of geohazards and mad me realized this was something I wanted to study and understand so such loss of life would not happen again. There are three elements to the events of March 11th that I am going to look at here; the earthquake, the tsunami and the Fukushima power plant. Each aspect a huge disaster in on there own but interlinked as they were caused devastation for Japan. Japan is a volcanic island which stretches along where the North American, Pacific, Eurasian and Philippine plates all collide at different points. 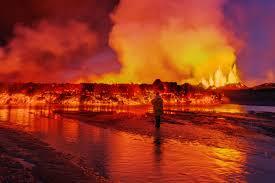 It is a part of the Pacific Ring of Fire, the world’s most tectonically active area. Practically all of our planets largest and most destructive earthquakes occur along the ring, one of which rocked the east coast of Japan at 2.46 pm JST (5.46am UTC) on March 11th 2011. Initial reports from JMA and USGS put the March 11th quake at a 7.9 but this had risen first to a 8.8 and then to a 9 before most of the seismic waves had even hit Tokyo 373 km away. Luckily thanks to Japans intense seismic network the countries capital had at least 80 seconds warning before they felt the strong shaking. It was the forth largest earthquake ever recorded and the largest ever to strike Japan. The displacement on the sea bed in turn caused a huge displacement of water in the Pacific ocean its self. Across a 180 km stretch there was recorded up thrust of 6-8 meters. Above the rupture the tsunami waves would have looked like no more than ripples on the surface radiating out across the ocean. It is as the waves reach the continental shelf and the water is forced upwards that they begin to take on their characteristic ‘wall of water’ appearance. At its maximum height (recorded at Miyako, Iwate) the waves hit 40.5 m high (133 ft). The Pacific has the most comprehensive tsunami warning systems in the world but even this gave only about 15 minutes warning from the earthquake to waves hitting the coast line. Travelling at speeds up to 500 mph the water surged up to 6 miles (10 km) inland. An estimated 5 million tonnes of debris began washing up on shore lines across the Pacific in the months and even years after the initial Earthquake. In April 2013 a 20 ft boat ran aground in California and was later identified as belonging to the marine sciences program at Takata High School, Japan. NOAA have kept tracks and aimed to clear as much of the debris as possible to minimize risk to ships and wild life but the operation can take more than a decade. 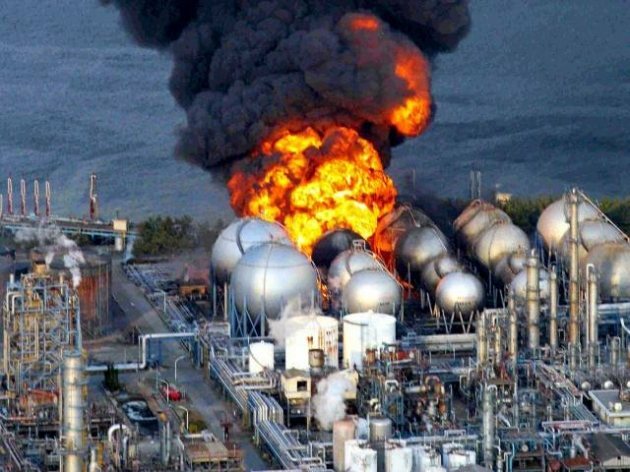 The melt down at the Fukushima was the worst nuclear disaster the world has seen since Chernobyl in 1986. The plant ran by TEPCO had 3 of its 6 units shut down for inspection when the earthquake struck. Units 1, 2 and 3 then under went automatic shutdown cutting off power. 50 minutes later the waves up to 15 meters high breached the measly 5.7 meters seawalls and flooded the basements of the turbine buildings and disabling the emergency generators. The lack of power meant the cooling systems of the 3 active reactors failed and eventually the heat caused by decay caused the containers to burst leaking radioactive material. It was classified a Level 7 on the International Nuclear Event Scale (INES) and its was the way the event was handled from the very beginning my TEPCO which saw the escalation in the threat. Approximately 15 PBq of caesium-137 was released along with some 500 PBq of iodine-131, luckily all the failed reactors were in concrete containment vessels, which limited the release of strontium-90, americium-241 and plutonium. No deaths were caused by the events or short term radiation exposure but it is thought people in the area worst hit will have a slightly higher risk of developing certain cancers in the future. Now 5 years on there is still a 12.5 km is still in place with thousands of people still exiled from their homes. The wild has reclaimed the land making it look like a scene from an apocalyptic film. It could be centuries before the area is truly deemed safe to live on again. Japan is no stranger to tsunamis; the 1896 and 1933 Sanriku earthquakes (Mg 8.5 and 8.4 respectively) also brought deadly waves. For this reason tsunami barriers have been constructed both on and off shore, trees were planted along the coastline, vertical evacuation buildings were built to the highest standards and regular evacuation training was introduced. But none of these were built to with stand the sheer force of a tsunami of this magnitude. In 2001 a team from Tohoku University published an article in Journal of Natural Disaster predicting such an event occurring every 800-1100 years. Within the Sendai Plain there is evidence of at least 3 major tsunami deposits all left within the past 3000 years. On July 9th 869 BC what is believed to be a magnitude 8-9 earthquake occurred off the coast of Sanriku causing a major tsunami which left deposits up to 4 km inland. So given that we knew an event like this had occurred before, why was Japan not better prepared for March 11th? Sadly human nature does not always listen to the reason of science. It is often easier to believe ‘it won’t happen in my life time’ and then brush the threat under the carpet for future generations. The problem is it does not matter how much we study the mechanics of our planet we are still no where near being able to predict these disasters with any degree of accuracy meaning preparation is our best defence. A report issued by the Japanese government in May 2015 claimed the events of March 11th 2011 caused $300 billion dollars. A confirmed 15,894 people lost their lives, 2,562 people are still unaccounted for. 5 years on the area is yet to recover. 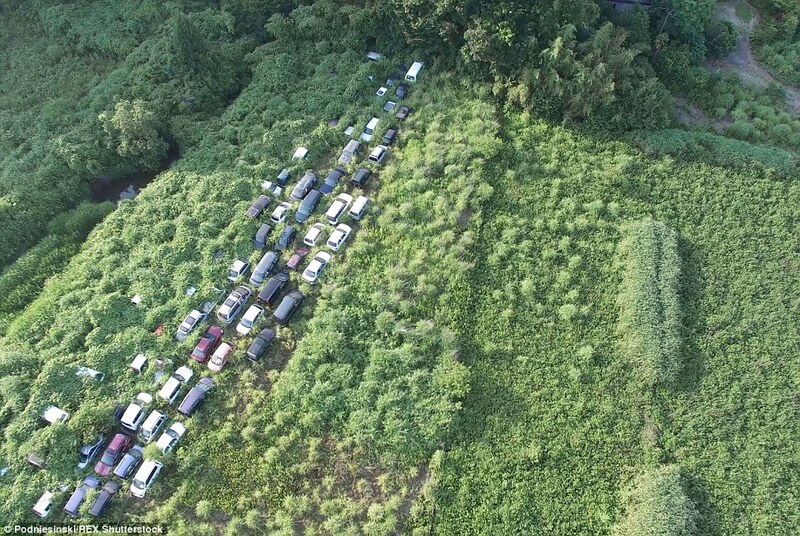 An estimated 174,000 are still displaced mainly due to the exclusion zone still heavily in place around the Fukushima plant. Soon as the initial rescue operation was completed the Tohoku Earthquake Tsunami Joint Survey Group was assembled. A team of natural scientists and engineers from 63 universities world wide set out to understand what made this tsunami so powerful and how we can protect our selves from further events. By the end of 2011 the Japanese government had passed laws to establish “tsunami-safe cities” and pledged billions of dollars to an intense 5 year clean up operation. It was clearly a bigger job than they originally thought…. Today there are still over 60,000 people living in temporary accommodation.For residents once living near the Fukushima power plant they will probably never return to there own homes. Sendai is still trying to recover from the tragic events but also now living in fear that this could occur again. It is for this reason I choose to go in to studying geoscience. We all live at the mercy of our planet and most of us never even consider the risk the land beneath our feet poses. Prediction, preparation and knowledge can save lives and this is what I one day want to help with. What Makes an Earthquake ‘Significant’? If you google “What is the definition of a significant earthquake?” you are met with Michigan Tech’s* response; Major – magnitude 7-7.9. However when looking at ‘significant’ earthquakes on the USGS** web page there are ones as low as magnitude 3.3. So to different people (and/or institutions) how we classify earthquakes seems to vary greatly and this occurs from top seismologists right through to media reporting and how we perceive the threat. At 11.23 UTC on May 30th a Mg 7.8 earthquake struck off the coast of Japan. This is the same magnitude as that of Nepal’s April 25th quake but one managed to devastate an entire region and the other barely shook a few skyscrapers. Unless, like my self you concern your selves with the rumblings of our planet, or you live in Japan or the surrounding area you probably did not ever know last Saturdays earthquake even happened. 1. Aftermath of Nepal earthquake April 25th 2015. The main difference between the two is the location of their foci. The focus of an earthquake (sometimes called the hyprocenter) is often confused with the epicentre, however the epicentre is the surface area directly over where the earthquake takes place, whereas the focus is the actual point at depth where the snap of energy takes place. With the Nepal earthquake the focus was just 15 km under a heavily populated region. The buildings on the surface were poorly built and unable to with stand the violent shaking, bringing them crumbling to the ground killing over 8000 people. 2. Displacement by Japan’s March 11th 2011 earthquake. The Japan earthquake in contrast occurred off the coast, below the Pacific Ocean, although the some shaking was felt onshore. Many may assume this is safer than an earthquake under an urban area but several of the most deadly earthquakes occur at sea as they can induce tsunamis like that of March 11th 2011 which killed nearly 30,000 in Japan or the infamous Boxing Day Tsunami which killed as many as 230,000! Luckily on Saturday no tsunami alert was even issued, as the biggest difference between these two 7.8 earth quakes is depth. Occurring at 677 km beneath the surface, this deep-focus (below 300 km) earthquake happened so deep its distance from focus to surface is only slightly shorter than travelling from London to Berlin (690 km)!!! As seismic waves travel they dissipate, loosing energy so are never as intense as what they are closer to the source. 3. Diagram of an earthquake, highlighting its focus and Epicenter.the waves lighten in colour with distance from the focus to show their loss of strength. So so far we have magnitude, depth and location which impact on the devastation potential, but is there any thing else? Well we can expand on the last, location, to highlight other potential threats posed by an earthquake. A moderate sized earthquake in the heart of Los Angeles or Tokyo may stop the subway and send food flying off shop shelves but casualties should be low. The same earthquake in a country like Nepal or Haiti can kill thousands. 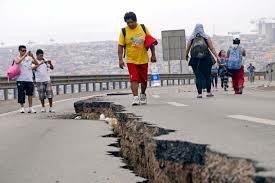 Earthquakes don’t kill people per say, I have never heard of some on being shaken to death by a quake.What kills people is poorly constructed buildings collapsing, bridges failing, gas mains bursting causing fires. After past disasters such as San Fransisco’s great earthquake of 1906, wealthy countries which sit along active fault lines have put in place strict building codes and pumped millions in to disaster management programs and construction. Obviously earthquake-proof is not always a possibility by earthquake-resistant definitely is and has saved the lives of many of the past few decades. Sadly not all at risk areas have that luxury of these safe guards at the expense of hundreds of lives. 4. 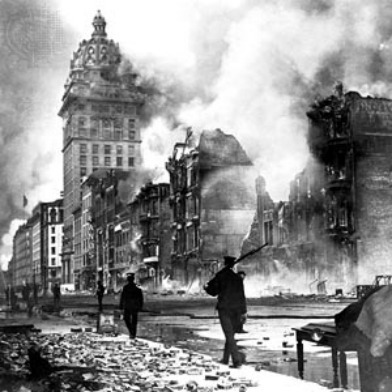 Damage and fires caused by the Greath San Fransisco earthquake in 1906. Seismology is a tricky business. With so much to take in to consideration when classify earthquakes, it is easy to see where there is often conflicting statements. Things are complicated further by the multitude of scales actually used to quantify them. When asked what scale is used, I can guarantee most will say the Richter scale (or local magnitude, ML), that is even what I was taught in school. Charles Richter first put his scale to use in 1935 to give a more scientific quantification for earthquakes than the previously used Mercalli scale which was solely based of human perspective and building damage (this is still used today but not as often). The Richter scale was limited in many ways being primed for nearby, mid-sized earthquakes (M 3-7). Seismologist Beno Gutenberg expanded on Richter’s work greatly enabling the scale to factor in greater distances and separated scales for surface waves (MS) and body waves (Mb).The revised scales still had difficulties and were particularly ineffective when looking at earthquakes which spanned great lengths of fault lines such the Aleutian Fox Island quake of 1952. The Richter scale was finally replaced by the Moment magnitude scale (MW) back in 1979 and this is the scale used by most institutes today including USGS. Moment magnitude was born from elastic dislocation theory put forward in 1972 which suggests that energy release from a quake is proportional to the surface area that breaks free, the average distance that the fault is displaced, and the rigidity of the material adjacent to the fault. It is based on a similar logarithmic scale to the Richter scale with each step equating to an increase in the amount of energy released 101.5 ≈ 32 more than the previous. 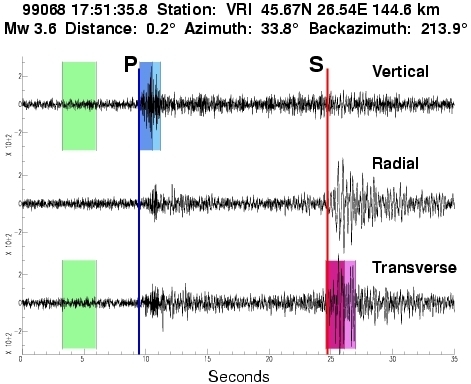 Earthquakes usually have similar Richter and moment magnitude numbers but rarely exactly the same and this can be one way one earthquake can be reported at different levels across the media if their sources used different scales. Another way which causes different figures is precision; the more seismic stations used to calculate magnitude the more precise the result. When an earthquake is first recorded institutes are likely to only use their own data but as soon as they have access to the global seismic network they can give a more accurate classification. This happen with Japan’s earthquake on May 30th, initial reports put it over a magnitude 8 but this was quickly downgraded to 7.8. As you can see an earthquakes significance is a matter for debate and in many cases personal opinion. Magnitude and location (not just geographically but also politically) are the main factors but it tends to vary earthquake to earthquake. 5. Example of a seismograph. March 22nd – 28th marks international Tsunami Awareness week. 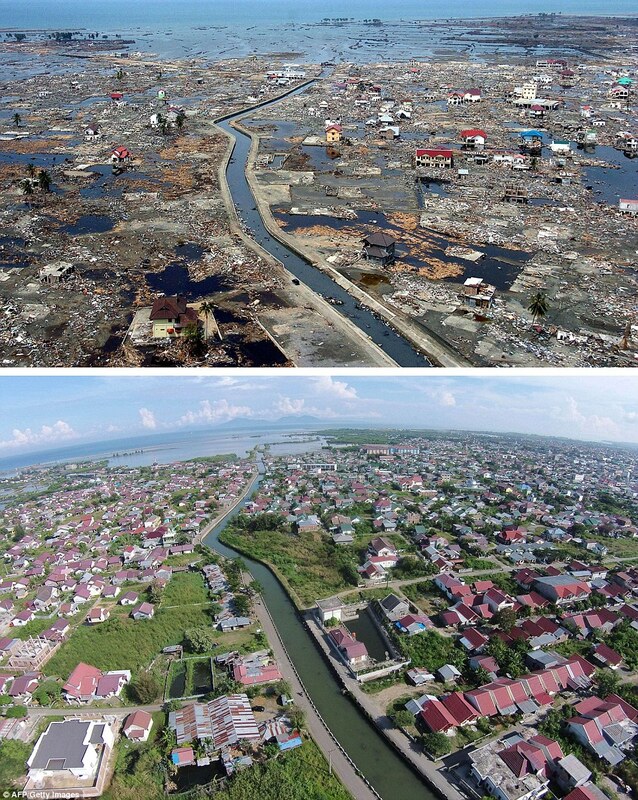 In the past decade humanity have witnessed to devastating tsunamis; Boxing day 2004 and Sendi March 11th 2011, both giving the world the bleak reminder of waters destructive power. But what actually is a tsunami and why are they so destructive? a long, high sea wave caused by an earthquake or other disturbance. The literal translation of ‘tsunami’ is ‘Harbour Wave’. This comes from the fact in open water a series of tsunami can travel thousands of mile visibly undetectable until they reach shallower waters causing them to rise up to the walls of water we know them to be. They are caused by a large displacement of water most commonly by an earthquake or landslide, and are by far one of the most deadliest types of natural disaster. 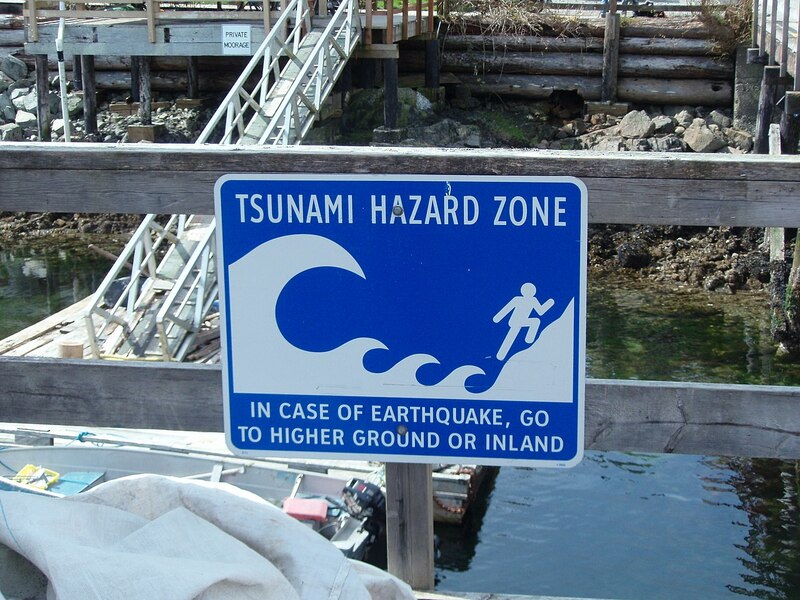 If you are in a coastal area and feel an earthquake it is often best to head to higher ground even if a tsunami alert has not been given, although most areas prone to tsunamis have quiet good warning systems waves still travel at speeds of up 500 km per hour, so even a few minutes warning may not always be sufficient. The first warning of an income tsunami is often what is known as draw back. As water is displaced is often pulls water out to sea, so if you were sat on the beach it would appear as if the sea was withdrawing like at low tide but very quickly. Again if you see this, always best to get to high ground as quickly and calmly as possible. A common misconception is that a tsunami is one wave, it is actually a series of waves. Also the first is often not the most powerful. This is why it can seem as the water just keeps coming as it gets further inland, its being forced by further waves. Subduction zone earthquakes tend to cause the most powerful and deadly tsunamis such as the Boxing day or Sendi however the largest ever wave ever recorded was from a landslide induced tsunami at Lituya Bay, Alaska in 1958. Waves reached over 500 meters tall all this is in part the the shape of the bay as opposed to a landslide going in to open waters. Over 80% of tsunamis occur in the Pacific Ocean, the ring of fire. If you are on a coast line in a at risk area, especially if holidaying and not too familiar with the area, make sure you check for evacuation routes and either easy access to high ground or strong, stable buildings which you can take shelter on high floors (wooden or unstable structures can be washed away!). The small Caribbean island of Jamaica is not one you usually associate with quakes but it does in fact transverse several fault lines. It lays where the Caribbean plate is moving westward relative to the Gonâve microplate with the main fault lines being the Enriquillo-Plantain garden fault zone in the east and the Walton fault zone to the west. The faults cause an average of 200 – 400 minor quakes a year on the island and is a part of the same fault system which cause the devastating Haiti quake of 2010. Jamaica its self has had a fair few big earthquakes, luckily there tends to be around 100 years between events. January 14th 1907 was one of the worst in recent history. At 3.30pm local time a magnitude 6.5 earthquake along the sinstral strike-slip fault. Every house in Kingston was damaged and a local tsunami was triggered causing waves 6-8 ft crashing in to the northern coastline. Fires raged for hours after hindering rescue attempts for people trapped under the collapsed buildings. It is estimated between 800 to 1100 people were killed although even official death tolls varied greatly. Over 10,000 were left homeless and over $25,00 000 worth of damage was caused leading it to be refered to as one of Jamaica’s worst natural disasters. Most of the damaged occurred in Kingston, although Buff Bay and Anotto Bay were also badly effected. The main tremor lasted 35 seconds and was followed almost immeadiatly by a slightly weaker after shock. The only seismograph on the island was actually damaged by the earthquake meaning that magnitude and epicentre had to pretty much be guessed from witness reports. Over 80 aftershocks occurred over the next month pulling down already destroyed buildings. At the time buildings were poorly constructed to withstand any level of earthquake and this was made worse by the bedrock of the area being mainly unconsolidated sands and gravels meaning a greater intensity on the surface and ground deformation. One positive outcome was the greater awareness of the seismic threat to the island. Building codes were put in place as the city was rebuilt to limit future destruction, earthquake and fire insurance became available to residents and better monitoring systems were put in place. Sadly a full seismic network was not put in place until after the 1957 Montego Bay earthquake. Over the last 12 months we have seen some amazing eruptions, felt the Earth shake on numerous occasions, and remembered some historic events. But was the active of 2014, both volcanically and seismically, more than any other year? I have read several spam articles recently, scare mongering that fracking has trebled earthquake numbers, God’s wrath has been shown by volcanic eruptions and even one drunken woman tried to tell me that Japans tectonic misfortune is due to the Pearl Harbor attack! 1. Lava field at Holuhraun, Iceland September 2nd 2014. Now straight away I can assure you that karma or religious intervention has nothing to do with the science behind the mechanics of the planet beneath our feet. Fracking is up for debate and its effects on seismicity although even were proven the effects are still negligible. So has 2014 really been worse than previous? I found quiet a nice table to demonstrate this one courtesy of Wikipedia. 2014 actually had the lowest number of strong, magnitude 7 and above earthquakes then in the past 5 years. On the flip side of this we had many more lower magnitude 4-5.9 giving us the highest total of quakes in the past 10 years by about 900 earthquakes. 2009 actually is the strangest year on this list with a good 4000 less earth quakes of any magnitude than any other year. 2007 also stands out with an exceptional number of stronger earthquakes. It could be theorized that the greater release of stress and strain with in the crust during 2007 gave us a quiet period the following years. All though this is a very short time scale it does show that yearly variation is great. 625 people were killed in earthquakes last year with most of these during August 3rd’s Ludian County earthquake in China. 6 lost their lives in the strongest quake of the year in Iquique, Chile which was mg 8.2. Nicaragua and Papua New Guinea also had one fatality each. This is actually quiet low value with over 1500 loosing their lives the previous year or as high as nearly 300,000 in 2004! 2. Uplift caused by Mg 8.2 Chile Earthquake. 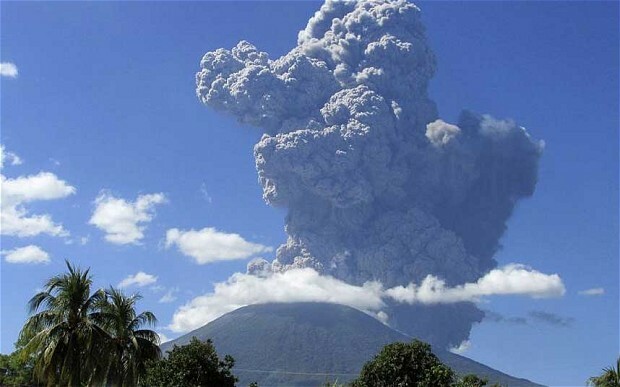 2014 was a pretty explosive year with Sinabung kicking us off with a bang January 3rd as it has done this year. In February the same volcano killed 11 as people began to cross the exclusion zones to take a closer look after the pyrotechnics the month previous. The next lot a fatalities happened when Mount Ontake surprised all with a phreatic blast on September 27th. 57 lost their lives as hikers and tourists where making their way to a shrine on the mountains flank. Fogo was the volcano to cause chaos in the final month of the year forcing thousands from their homes. Media coverage of this even has been so light on this event, I am unable to find precise news to if the eruption is ongoing. At December 23rd lava was still pouring from the Pico vent and destroying all in its path. Obviously these are but a few of the hundreds of volcanoes rumbling through 2014. Others include; Colinma, Etna, Aire, Asonsan, Manam, Merapi, Popcatepetl, Shishaldin, Cleveland, Sabancaya, Zhupanovsky, Sheveluch, Santa Maria, Mayon, Dukono, Turrialba, Poas, Fuego, Ubinas, Tungurahua, Reventador, Pacaya, Karymsky, Kelut, Stromboli, San Miguel, Pavlof, Chirpoi and even all that does not cover them all! But is this more than usual? In terms of lava output, last year is definitely high up there as we saw several huge effusive eruptions(with Bárðarbunga probably producing more material than most others put together!). However in the grand scheme of things there were few other major events. 68 people lost their lives which is relatively high thinking that on average maybe one or two die yearly unless there are major volcanic events, but then when thinking like that 68 is actually extremely low. If we were to pull out any year for increased volcanic activity, for me it would have to be the events of 1902. In a list compiled by Wikipedia* of the most deadly eruptions, although none of the top 5 occurred in 1902, 4 in the list of 40 that occurred did, meaning 10% of the most fatal eruptions occurred in the one year. Well over 40,000 were killed over these four eruptions. 4. 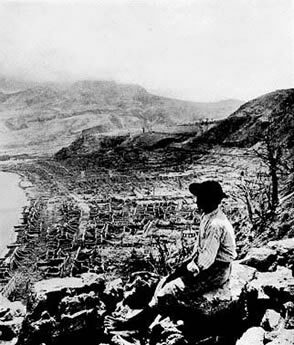 Somber scene after Mount Pelee eruption May 8th 1902. Just over 30,000 of these deaths were caused by Mount Pelee, Martinque on May 8th. Just hours before, La Soufriere a few islands away on Saint Vincent killed 1680. There will always be years there is more geologically activity than others. The Earth is like a living breathing organism; it is ever-changing and adapting, this is part of the reason predicting events can be tricky. People always look to blame or find meaning behind tragedy, it’s a coping mechanism, but rarely leads to scientific truth. Very few natural disasters have effected the entire globe quiet like the events of Boxing day 2004. For me, it was one of the first that captured my full attention and left me wanting to understand how in a matter of minutes thousands of people can just be wiped of the face of the Earth. The Indian Ocean lays on the western side of the Pacific Ring of fire where the Indio-Austrailian plate is subducting beneath the Eurasian plate along the Sunda trench. Tectonic activity such as earthquakes and volcanic eruption are everyday occurrence in the area. As plates move in relation to each other they can become ‘locked’, unable to move past each other. Over time stress can build up within the locked plate untill the stress can no longer be contained and snaps like a rubber band causing a massive release of energy in the form of an earthquake. This is known as a stick slip fault and is usually the cause of the most powerful earthquakes. On December 26th 2004 this occurred in spectacular fashion along the Sunda trench. A magnitude 9.2 earthquake rocked the Indian Ocean at 7.58 am. Over an astounding 1600 km stretch of the trench, uplift was recorded to be on average 6 meters. This massive displacement of such a long length of sea bed thrust the ocean waters upwards as well causing tsunami waves which would travel round the world. Such a powerful earthquake is termed a megathrust and released the energy of over 1.1×1017 joules, which is the equivalent of 26 megatonnes of TNT or 1500 Hiroshima atomic bombs. Despite its violent geology the area is a travelers paradise with millions flocking to the islands year round. Its equatorial location means year round sun and therefore in especial popular as a Christmas destination. On Boxing day 2004 the beaches were filled you tourist from around the world blissfully unaware of the danger that loomed off the coast. The first inclination that something was very wrong along the white sandy beaches was a process called draw back. As the earthquake thrusts water up directly above the epicenter water is pulled in from the local area to balance the displacement. From the local shorelines people could see the sea withdrawn quiet rapidly like low tide happening in very fast motion. At the starting location the tsunami wave looks no more then a small bump on the surface of the ocean and travels at speeds of 500 – 1000 kilometers per hour. As is nears land and the sea floor rises up to the coastline as does the wave rearing up on its self; in this case in excess of 30 ft in places. Over 275,000 people were killed in fourteen countries across two continents, with the last two direct fatalities being swept out to sea in South Africa, more than twelve hours after the earthquake. Scores more died in the coming weeks as decaying bodies and pollution made the spread of disease. Nearly 150,000 homes and buildings were destroyed by the waves. Identifying bodies was near impossible new mortuaries had to be quickly constructed to handle the masses. In other cases some bodies took months to be washed up on shore and in others they were simply lost at sea. Public response to the tragedy was unprecedented with over $14 billion US dollars raised by the public world wide, with about the same given by varying governments. It was by far not the worst or most fatal natural disaster in recent years but it touched the hearts of nations world wide at Christmas so every one flocked to help. Different governments and agencies tended to stick to certain regions in the relief effort as seen above in a relief map produced by the Red Cross. Now ten years on, the countries involved are well on the road to recovery but still scared by the events that Christmas. This years anniversary has seen coverage of the area rocket, with some stunning imagery showing how far certain areas have come since the devastation in 2004. In short, yes. This was the not first major earthquake in this area now will it be the last. By January 1st 2005 there had already been 84 aftershocks ranging between magnitudes 5 to 7. On March 28th 2005 the biggest aftershock occurred just a few hundred kilometers from the original epicenter. Another tsunami was trigger but luckily waves of barely 10 ft were recorded in the local area, still 1346 people lost their lives. With the tectonic location of the Indian Ocean and its islands, it is never a matter of ‘if’ but a matter of when such events will occur. What hinder this further is it is one of the most densely populated areas of the world but its equatorial weather and fertile volcanic grounds make it prime location for people to live regardless of risk.